Research findings show essential ingredient helped group pack on five pounds of muscle in just eight weeks. 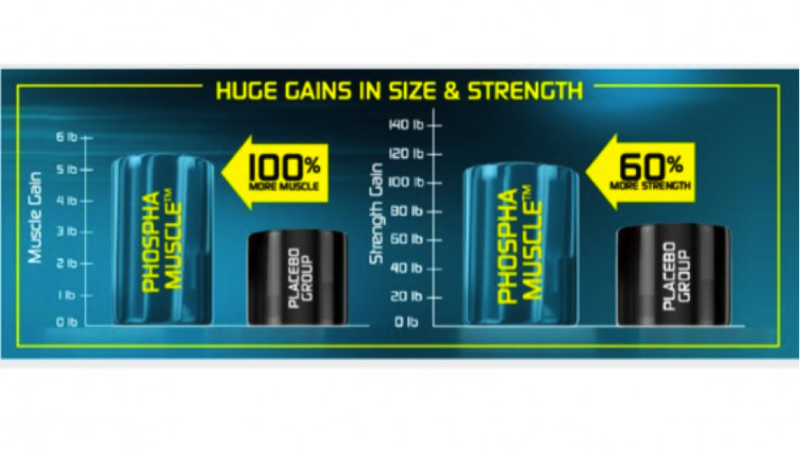 PHOSPHA MUSCLE delivers the purest form of phosphatidic acid to boost these effects and give you the size and strength you want! Phospha Muscle powers the mTOR pathway through phosphaticdic acid (Mediator ingredient), which is a signaling lipid. For starters, when you lift a heavy load, your muscle fibers receive that mechanical stimulus — triggering the release of phosphatidic acid. From there, the lipid binds to mTOR and activates mTOR complex 1, which causes the growth and repair of muscle. The more phosphaticdic acid that’s present, the more amplified effect it has on protein synthesis. Pre-clinical research has shown that phosphatidic acid enhanced mTOR signaling by over six times compared to baseline. Nutrition & Metabolism proved that soy-derived phosphatidic acid increased mTOR the most. At the University of Tampa, participants supplementing with Mediator packed on 5.3 pounds of muscle in eight weeks. These participants also increased their strength on the leg press by 60 percent.